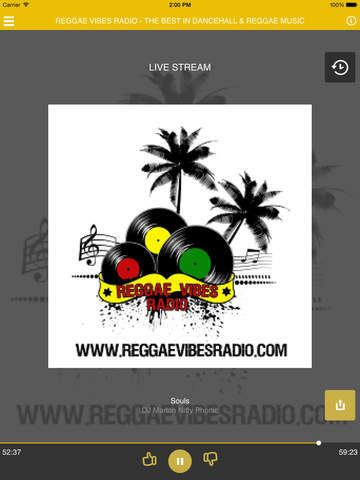 The Ultimate in Dancehall & Reggae Music. Quality Music 24/7. Live shows. Artist promotions. Great Interviews. Located in Atlanta, NY & Kingston Ja. 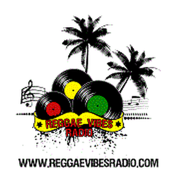 In October 2011 Reggae Vibes Radio was founded to serve as a conduit for upcoming reggae artistes to showcase their skills and talents. They wanted to have a focus on the Atlanta and New York dancehall, reggae and soca party scene. It was also their intention to provide a means of networking for Caribbean listeners the world over. 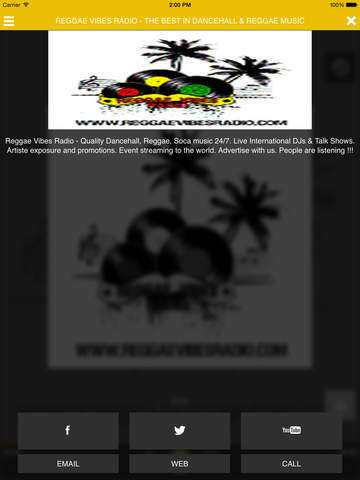 Reggae Vibes Radio was launched on a platform of promotional ventures. In 2013 they were part of a joint live broadcast from the Atlanta Caribbean Festival, and also broadcasted live from the Caribbean American Cultural Festival in Mcdonough Square Atlanta.